Most Victorians rented their homes and therefore had little control over their external appearance. Instead they focussed on the inside of the home. Furniture was seen as a reflection of social status, with grand and ornate pieces used to display the putatuve wealth of the family. As guests were only admitted to the best rooms in the house (hall, parlour, dining room), these rooms were decorated with meticulous care. 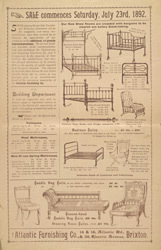 Stores such as the Atlantic Furnishing Company stocked ready-made furniture for all these rooms: far cheaper than having the furniture specially made.